Ranger grazing – hair and all. Special thanks to Kelly Hoodenpyle for the amazing picture. Ranger is our six-year old American mustang horse. And while Ranger is a perfectly good horse name (his official name is Lone Star Ranger), I really should have named him Fabio. Let’s start with the obvious, the horse has an amazing mane. It’s full and long, with his forelock covering his eyes. It blows in the wind, is fun to brush, and looks gorgeous when he runs through the pasture. His tail is equally as impressive. Practically touching the ground, and double bonus, it’s oodles of fun to braid. While I’m definitely a proud mama, the little guy is a looker. His second fabio-esque trait is the fact that the horse just likes to pose. 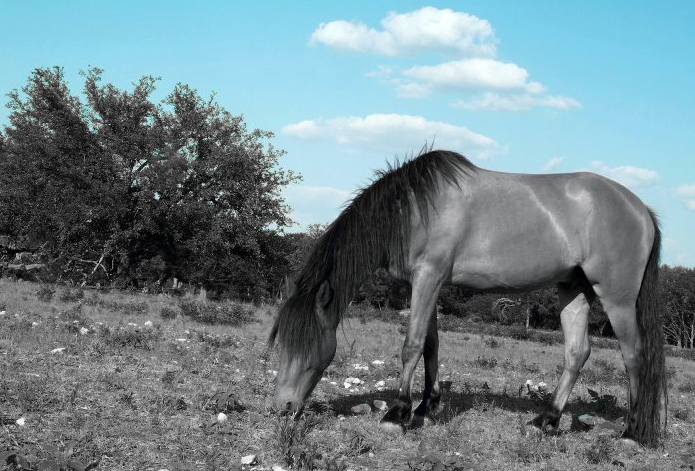 Cowboy will often look out into the pasture and say, “Your horse is posing again.” While the farm is relatively flat, there is some slight variation, and we have small berms throughout. Ranger tends to find a berm, wind a blowing, and just stand there, as if to say, “Aren’t I just the most handsome horse you’ve ever seen?” It simply makes me smile every time. His third fabio-esque trait is that he likes the ladies. He’s a gelding (and for my city friends that means he shouldn’t care about the girls, think Bob Barker spay and neuter your pets), but he is IN LOVE with our mare, Sweet Suzy Q. What’s even funnier is that she’s 22 years old. But to be fair, she’s equally sweet on him. Does that make my horse a cougar? I digress. The point is that Ranger spends an inordinate amount of time following her around and placing himself between her and the other geldings. And like good geldings, they don’t care about Suzy or that Ranger is trying to be a bossy pants about who Suzy stands next to. So there you have it, Ranger should have been named Fabio. But to me, the part that is most interesting is his personality. You see, before I had horses, which was not that long ago, I really never thought of them as having personalities. I thought of dogs and cats with personalities, but it just never occurred to me that large animals are just as funny, amazing, and often times neurotic. The truth is that they have personalities in spades. Some love attention, some are playful, some are curious and get into all sorts of things. Ranger happens to fall into the latter category, prompting our trainer to say he should have been named Dennis the Menace, since he doesn’t mean to get into trouble he just can’t help himself. But that’s another story for another day. Ranger is my first horse. He’s taught me more than I could have ever imagined. Cowboy likes to say that our biggest challenge with Ranger is that he’s smarter than we are. So whatever you call him, my horse by any other name is still Ranger. Mustang, magnificent, and all mine. A small plug, if you have never experienced the beauty or the story of our amazing American mustangs, wild horses who live on government lands, check out the MustangHeritageFoundation.org or ExtremeMustangMakover.com. Ranger is a makeover horse who competed as a yearling. We were blessed to adopt him into our family.